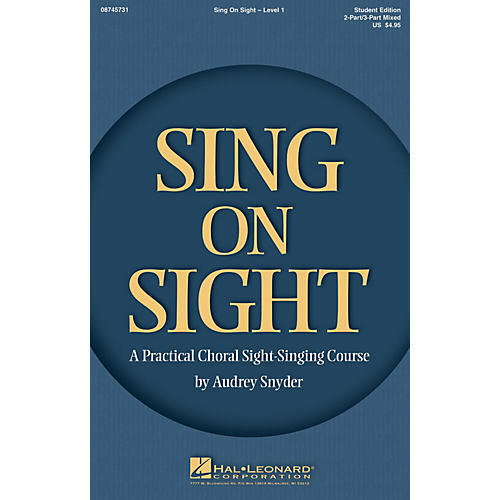 Sing on Sight is a comprehensive sight-singing method by Audrey Snyder. Volume One assumes no previous experience and begins with simple rhythm practice proceeding step-by-step to full, choral sight-singing. The recorded accompaniments include a wide variety of styles, from classical to contemporary, and folk music to pop and jazz. Exercises are written so that two or more lines may be sung simultaneously, so students gain sight-singing independence and develop their part-singing skills. With just a few minutes a day Sing on Sight can help your choirs learn to read music and have fun in the process! Student and Teacher Editions available separately: both Unison/2-Part Treble and 2-Part/3-Part Mixed. Accompaniment CD (coincides with both voicings) also available.